Lawrence O'Donnell, already infamous for his in-your-face rant at John O'Neill of the Swiftboat Veterans, is at it again. This time, the object of O'Donnell's obloquy is Mitt Romney, and in particular his Mormon religion. 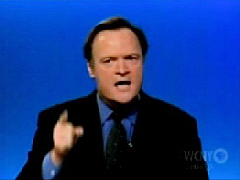 Appearing on last night's McLaughlin group, O'Donnell indulged in an angry, protracted condemnation of Mormonism. This was the worst political speech of my lifetime. Because this man stood there and said to you "this is the faith of my fathers." And you, and none of these commentators who liked this speech realized that the faith of his fathers is a racist faith. As of 1978 it was an officially racist faith, and for political convenience in 1978 it switched. And it said "OK, black people can be in this church." He believes, if he believes the faith of his fathers, that black people are black because in heaven they turned away from God, in this demented, Scientology-like notion of what was going on in heaven before the creation of the earth. [In full rant mode] He's got to answer, when he was 30 years old and he firmly believed in the faith of his father that black people are inferior. When did he change his mind? Did the religion have to tell him to change his mind? And when he talks about the faith of his father, how about the faith of his great-grandfather, who had five wives? His religion is based on the work of a lying, fraudulent, criminal named Joseph Smith who was a racist, who was pro-slavery, whose religion was completely pro-slavery. He was given an opportunity to distance himself from the evils of his religion, and he didn't. Joseph Smith was a slavery champion, the inventor of this ridiculous religion. His religion is full of crazy beliefs. Everyone on this panel thinks his religion is full of crazy beliefs. Everyone of us does. You won't believe it. Do you think the Garden of Eden was in Missouri? O'Donnell used his show-ending prediction to round on Romney again: "The mainstream media will remain united in its refusal to ask Mitt Romney any questions about the history of his racist, pro-slavery, anti-American and otherwise inexplicable religion." It's interesting to note that Smith's campaign in 1844 sought to end slavery. Smith's solution was gradualist -- to purchase the freedom of slaves with funds amassed by the reduction in the size of Congress, pay for members of Congress and the sale of public lands. "He felt slavery was not right and saw the need to abolish slavery to preserve the nation. But he also realized the need to save the economy of the South." He "refused to take the extreme abolitionist point."